At the start of November my boyfriend and I went to Montreal for a long weekend, and although it was rainy and freezing the whole time, we still made the most of it. We ate lots of good food, did a bit of sight-seeing, and I was very happy because it’s the home city of Leonard Cohen who is one of my favourite people in the entire world. Perhaps it's a bit morbid to start this post with a photo of a grave, but not only was Leonard Cohen my reason for visiting Montreal, but he and his work bring me nothing but comfort and joy, so it doesn’t feel that way to me. Although it’s still terribly sad that he passed away, I have so much to thank him for because the impact he has had on my life is immeasurable and I love him endlessly. The reason we went when we did was because on the Monday there was a Leonard Cohen memorial tribute show, which was organised by his son, Adam. I was lucky enough to see Leonard live 5 times while he was around, and although it was never going to be the same as the real thing, it was still incredible to see so many different artists come together to pay tribute to his memory. Canadian Prime Minister Justin Trudeau and his wife spoke, and there were performances by Adam Cohen, Elvis Costello, Lana Del Rey, Feist, Courtney Love, Sting, k.d. Lang and heaps of others. A lot of Leonard’s band and backup singers from the last few years of touring made up the band on stage, and they played little clips of Leonard in between songs. Even Seth Rogen came out to read one of his poems. I cried on and off throughout the whole thing, and even my boyfriend, who isn’t really a Cohen fan said it was incredible. When I visited his grave an older couple turned up while I was there, and naturally we got to talking about him. They had flown in from Manchester for the show, and have been fans of his since before I was born (if you didn’t know he’s been writing poetry since the ‘50s and making music since the ‘60s). A huge mural has been painted on the side of a building just off Boulevard Saint-Laurent in the Plateau, which was his old neighbourhood, so now he watches over the city. The home he lived in is not too far from there, and they were both quite close to our AirBNB, so naturally I made sure to pay them both a visit. Funnily enough, around the time I was there the city inaugurated a second, even bigger mural in the middle of downtown which I didn’t see. There’s also an exhibition on his life and work at the Musée d'art contemporain de Montréal, so I have at least two reasons to go back again soon! We flew in on a Saturday morning and after dropping our bags at our AirBNB we spent all afternoon walking around the Plateau and Mile End neighbourhoods. The area is actually really spread out, so if you’re thinking of doing it on foot like we did, I’d suggest wearing comfortable shoes. There are lots of fun little shops and restaurants all around here, so it’s a great place to stay if you don’t fancy a hotel in the middle of the city. Two of the best shops we went into were Annex Vintage and Empire de l'Échange. I’m not sure what the relationship is, but at the counter they have a little map showing both of them as well as a couple of other shops that are similar and equally cool. We went to a few of them and they have a range of pins, patches, candles, notebooks, etc. by independent artists as well as a small selection of vintage clothes up the back. My boyfriend has recently become obsessed with pinball, so we had to pay a visit to North Star which is a cool little bar with a bunch of old machines and a view of the Leonard mural. They also have Red Needles on the menu, which is a cocktail that Leonard himself invented! I don’t drink so I left those to my boyfriend while I enjoyed the house-made rose lemonade. The bartender was playing blues on the record player and they had a photo-booth too – basically this place had everything I could possibly need! After we’d worked up an appetite playing a million games of pinball we walked down the street to Burger Royal, who have a very extensive menu and a vegan patty that you can sub into any of the burgers. As well as pinball, my boyfriend is also obsessed with bagels so we had to try them from both St-Viateur and Fairmount since they’re both supposed to be the best in town. I’m not sure what exactly makes it a Montreal bagel, but they were goddamn delicious. 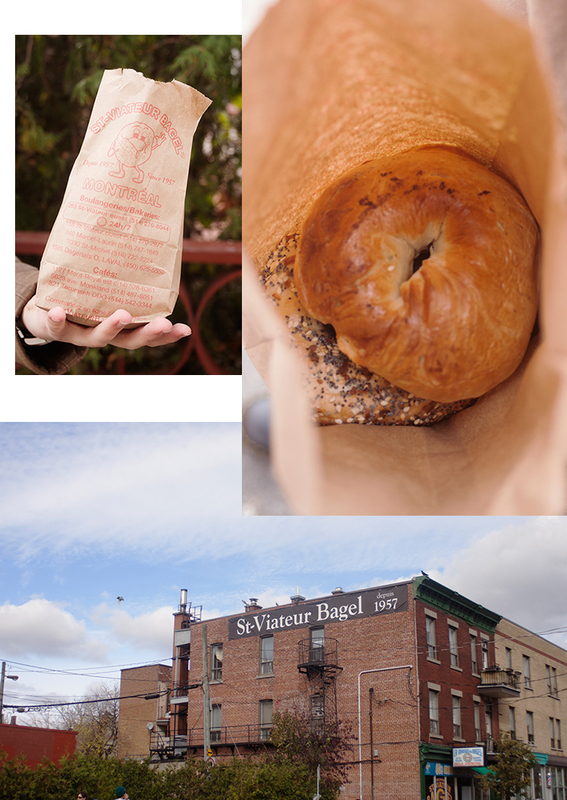 If you only want to go to one of them, we both preferred St-Viateur because not only do they have a bigger shop which means there’s more room to move and for people to form an orderly queue, but the bagels were better too. I had an exceptionally good “everything” bagel, and they sell little tubs of cream cheese or peanut butter or jam that you take with you so you can eat it straight away. We were told that we had to check out Old Montreal while we were there, so that’s what we did on Sunday morning. It actually reminds me a lot of the Rocks in Sydney, and aside from the standard rubbish tourist shops, it’s pretty cute. We found a place for breakfast called Taverne Gaspar that was nice and cosy and was in an old warehouse from the 19th century. After that we wandered through the streets until admitting to ourselves that it was too cold and we’d have to move on to our next activity (the Biosphère de Montréal museum). After the museum we ended up at Pizzeria No. 900 for a late lunch. I’d read online that this place had good pizza, and I mean, let’s be real almost all pizza is good pizza, but this was REALLY good. We had dinner reservations that night so we shared a one person sized pizza to avoid overdoing it, but I was seriously tempted to order second one. For dinner on Sunday night we went to Lov because although we didn’t realise it when we booked the trip, our anniversary was on the following Tuesday, so we celebrated early because we knew we’d be too tired after flying back on Tuesday morning and going to work. I found Lov online and not only is the interior of the restaurant absolutely beautiful, but the menu is all vegan and it was delicious! The Biosphère de Montréal is a museum on the Ile Sainte-Helene in the middle of the St. Lawrence River. It wasn’t exactly mind-blowing as a museum, but the external structure is pretty cool, and when the weather isn’t great it’s nice to do something that keeps you indoors for a few hours. It was easy to get to on the Metro, and the gardens on the island are quite pretty too. Interestingly, the Metro is entirely in French with no English announcements, which seemed strange to me as I thought they’d at least be in both languages. But since it’s not a huge city we had no trouble getting around so it didn’t bother us. On Monday we had breakfast at Beauty’s, a cute, old-fashioned diner near Mount Royal. Mark actually had to work because he didn’t have any days of annual leave to take for the trip so he went back to our AirBNB once we were done - since he works from home normally it was easy for him to get himself set up. The diner wasn’t too far from the cemetery where Leonard’s grave is, so I walked over after breakfast, and on the way there is a beautiful forest that was in full autumn mode. I wandered around the Plateau area again before heading home to meet Mark for lunch. Rumour has it that poutine originated in Quebec so even though it’s everywhere in Canada, we had to have it while we were in Montreal, so we went to Poutineville which my friend recommended because it has vegetarian gravy. That night was the show, so we had an early-ish dinner at L’Grose Luxe. They have lots of locations around the city with veg-friendly menus, but we were staying near the one that’s 100% vegetarian, so of course we went there. It has a really cool vibe and super delicious food, so if there was one of these in Toronto (or Sydney) it’s definitely the kind of place we would hang out in.